I have been applying contemplative dance in my arts participation practices consistently for the past five years. 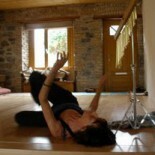 Contemplative dance is supported by many dance forms and aligns well with somatic practices. It has been a practical approach in expanding my artistic repertoire because of its depth and simplicity. I have applied principles of contemplative dance practice to researching urban and rural challenges in communities of interest. Projects such as Ballygar 2020, Ciúnas NUIG, and Walking Wisdom have all benefited. More recently I am applying it to the support of mentoring and supervision. Gratitude to Barbara Dilley, the originator of this work. Please see http://www.barbaradilley.com for more information.